I got no linux-* packages installed. I don't think that linuxulator should somehow be related to palemoon build. I installed without problems and it works. I am looking for some extensions (safety-security) but there are not so many and I didn't try Firefox extensions yet. I didn't try Firefox extensions yet. You should, a lot of FF extensions works fine with PM. I did try Privacy Badger and Ghostery but it didn't work. I got message tha PaleMoon doesn't support webextensions. one of them is webextensions, try others. But is possible to try to install incompatible addons with Moon Tester Tool, it may work. press "Save object as...", save .xpi file, then install it using Moon Tester Tool settings. I'm using Adblock Latitude, Change Referrer Button, Complete YouTube Saver, Eclipsed Moon, Encrypted Web, Moon Tester Tool and NoScript as palemoon extensions. 1. Install and activate Greasemonkey for Pale Moon (PM restart required). 2. Install savefromnet helper js script using greasemonkey. 3. Configure and disable savefromnet ads using greasemonkey button (script commands --> settings). No, that must have been someone else. I do need a good download manager though and DownloadThemAll! is what's best IMO. It doesn't work on YouTube so I use something else on that. Being able to selectively enable JS goes along with that so NoScript is really essential for me. I did a portsnap fetch install, updated my repositories yesterday. Then tried to build www/palemoon. CFLAGS="-O2 -pipe  -O3 -DLIBICONV_PLUG -fstack-protector -isystem /usr/local/include -fno-strict-aliasing"
CXXFLAGS="-O2 -pipe -O3 -DLIBICONV_PLUG -fstack-protector -isystem /usr/local/include -fno-strict-aliasing  -DLIBICONV_PLUG -isystem /usr/local/include"
No OPTIONS_DEFINE in make file makes it fairly difficult to pick your choice of audio options, and, by this I mean it never shows up as an option. This is why it stopped for me. 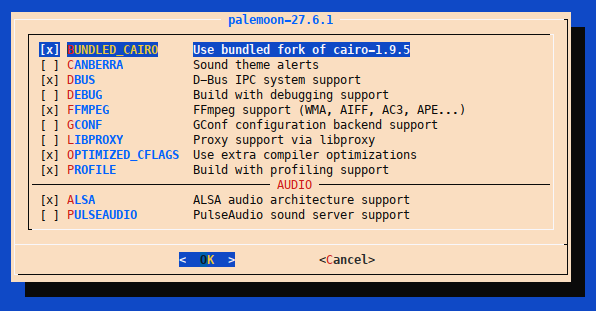 rhsbsd , if you manually build palemoon, you will see the configuration dialog to make a choice of audio (among other options). If it doesn't show up, you can run it explicitly: # make config. ILUXA , I was able to build palemoon from the recently updated ports in that "bad" box without any issues. I did run # make config and as I mentioned earlier the option for audio/sndio never shows up. Below is the relative excerpt from the www/palemoon makefile. Without a OPTIONS_DEFINE how do you expect this to work? Just look in the /usr/ports/www/palemoon/Makefile. Thanks for the reply. Right, there is no option SNDIO anymore ― as you can see on my screenshots. Why ALSA? How it's supposed to work (and works) in FreeBSD? ALSA, as far as I know, is just only wrapper for OSS in FreeBSD. That's why it is working so fine. It is Ok, that screenshot was made before PM was ported using files from first porting attempt, using some FF port files, it seems. I have emailed lichray@gmail.com. Listed as the maintainer. I'm fairly certain the /usr/ports/www/palemoon/Makefile requires a fix. I've read somewhere in comments from the first patch, that PM won't work with SNDIO at this moment. I read somewhere in comments from the first patch, that PM won't work with SNDIO at this moment. It perfectly works with the port snapshot you attached earlier. It didn't work for me, I also tried to build it with SNDIO. May be you built it using few sound options, that's why PM wasn't muted for you (but then SNDIO should been conflicting with others...). No, just checked: I built it with only SNDIO. How to deal with User-Agent string? It looks that none of the available extensions work. Certain web sites do not like Palemoon at all, that's why it's good to have one. You can remove SNDIO from OPTIONS_EXCLUDE and make config again. All gecko-like browsers share Firefox's options definition, so we don't need to explicitly define one. We hide SNDIO because we are not sure whether it works. So firstly I guess that it would be nice if some sort of language explaining above was included in /usr/ports/www/palemoon/pkg-descr so that us mere earthlings might get a grip. In this case I guess it's a new port and it's going to have a few growing pains. Since the out come of building www/palemoon with certain ports options is still unknown its also safe to conclude that performance/behavior characteristics are also unknown. I guess I'll just wring the crap out it and see what happens. Its almost done building. P.S. DONE! Music and video from u-tube confirmed. 1hr-5mins for the build. Just to confirm; manually edit and remove SNDIO from OPTIONS_EXCLUDE; re-run make config at which time sndio is available for selection; then re-build. Thanks! I had to add the toolbar button manually though. The agent string seems to be working, however, e.g. citi.com login page is redirected to "ServerError.html" (the same was before using the extension too). Is there anything else that web sites can check for? I built www/palemoon from ports on 2 of my laptops over the weekend using all default options without any problems. I'm not even going to install www/firefox on my recent builds. I have always liked that Change Referer Button. On the page of known incompatable add-ons for palemoon it shows you can use an older version of DownloadThemAll! so I'm happy as can be with www/palemoon. The agent string seems to be working, however, e.g. citi.com login page is redirected to "ServerError.html" (the same was before using the extension too). Answering my own question. The information below could be useful for those who have similar issues. For some reason the global user-agent string adjustment doesn't help. This add-on doesn't help either. Thanks anyway, ILUXA !